Pipes agrees with Wilders: "Islam is the problem." 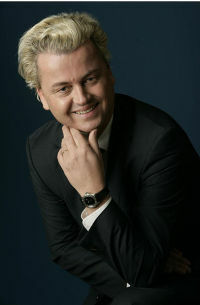 Wilders is a charismatic, savvy, principled, and outspoken leader who has rapidly become the most dynamic political force in the Netherlands. While he opines on the full range of topics, Islam and Muslims constitute his signature issue. Overcoming the tendency of Dutch politicians to play it safe, he calls Muhammad a devil and demands that Muslims “tear out half of the Koran if they wish to stay in the Netherlands.” More broadly, he sees Islam itself as the problem, not just a virulent version of it called Islamism. So how is he not an islamophobe, again? Indicative of this moderation is Wilders’s long-standing affection for Israel that includes two years’ residence in the Jewish state, dozens of visits, and his advocating the transfer of the Dutch embassy to Jerusalem.